The Ask McLovin’ column is written by the legendary, rad-man Canadian, Matt “McLovin’” Livingston. It is the longest running longboarding advice column in the world—known for its uncommon sensibility and youthful lack of foresight. Need help with skate-related problems? Ask McLovin’ provides poorly thought-out and humorously lame advice for all such issues. McLovin’ provides “new” perspective on your problems and questions. Like an over-talkative roommate, some random drunk dude, or “a second mother-in-law” McLovin’ calls it as he sees it. 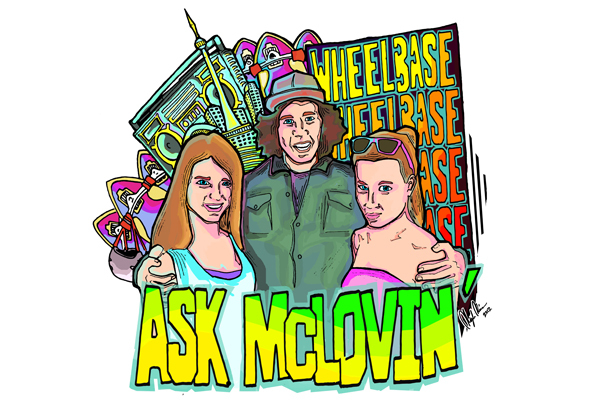 Once a month, McLovin’ picks a single question from his inbox and replies to it publicly via this Ask McLovin’ Wheelbase column. Make ‘em count, have fun with it, and stay rollin’. At Agenda with McLovin’: Bro Me Like Ya Know Me. Notes Of A Greasy Young Man: High Schoolin’ The Wheelbase Board Graphic Challenge The New Original Video Kills It!